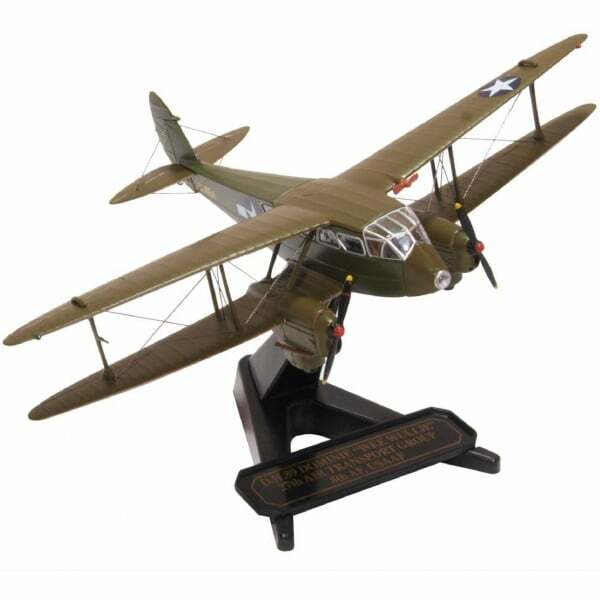 British built De Havilland DH89 Dragon Rapide is a 1:72 scale replica of the aircraft on display at the National Museum of the USAAF, located on the Wright Patterson Air Force Base, Ohio. In military circles the Dragon Rapide went under the name Dominie and was used for radio and navigation training and communications missions. Nicknamed ‘Wee Wullie’, our aircraft in real life was registered as N2290, with a Construction No. 6794. Its flight code number X7454 is printed along both sides of the fuselage, alongside the American Star. Decorated simply in dull green with grey underside, the refurbished Dragon Rapide represents the colours of the USAAF 8th Air Force as flown by the 27th Air Transport Group in 1942.Note a special detail on our model – the addition of an air speed windmill on the upper left wing. The Dragon Rapide, introduced in late 1933, was intended as a short-haul passenger airliner and used as such throughout its life, although it was also a very suitable aircraft for use by the RAF and other Air Forces during WWII for passenger and communications purposes.